Last night I spent the evening coding like no tomorrow till 4am (hence no tomorrow). I’ve revamped my sidebar menu to allow a sample shot section, a better introduction to my blog and a fancy flickr bar showing the latest 15 photos I’ve taken on the side, this was part of my site fattening procedure where I screwed all 800×600 users and move to the 960px territory. The site will be more flickr integrated than ever (don’t know what i’d do without it!). Of course the quality of posts will improve with time as well as more features here and there being implemented, so yeah, if you’re a previous visitor, hope you like, if you’re new, hope you like! Please leave comments on your thoughts and opinions on the site redesign, since the code hasn’t settled in just yet so I can still do additional tweaks to it. After months and months of coding I’ve finally managed to get Musecast.co.uk to launch. The site is pretty intense after we started putting in real content into the site. I’ve already received some feedback on the site and I’ve started up google analytics on the site to track the outcome. Pre launching the site was quite a painful experience, it included some MORE bug fixes (this time, loads more popped up!) as well as some quick features added onto the thing (such as a navigation bar for news and podcast so you can move to the next and previous podcast / news so news searching is easier). The tags in particular seems to work really well. It does provide an easier way of organising and finding information based on keywords. After all the bug fixes I had to export the database and import it into my client’s hosting server. After that, a few site configurations and the site was up and ready. I’m quite proud at the overall outcome of the product. Theres quite alot of features which greatly increases the chance of a user reading more pages within the site, theres also a great potential of using digg, reddit and delicious to further increase the exposure of the site to potential visitors. Now we play the waiting game (not really, I need to write the project now haha). That should be about it for the bug fixes, tommorow I will refresh the database so the id numbers are all nice and new and after that we’ll be able to enjoy a nice site launch. Hopefully. Extreme Programming and report finalising. Redesign the side so that the navagation menu is at the top rather then at the side to save space. Implement a user logging in and out system. I’m going to focus alot more on adding things such as digg, delicious and other social networking integrations. I’ll also be focusing more on my report. Right now I’m focusing mainly on finishing the podcast admin page, the page is similar to the news page, and finishing this means that I’ll be able to complete the main requirements of the site (ie the administrator can easily create, update, edit and delete records for both podcast and news). I’ll be targeting to complete this on Thursday evening. Afterwards its essential that I focus on the RSS section since I have the least knowledge about that section. 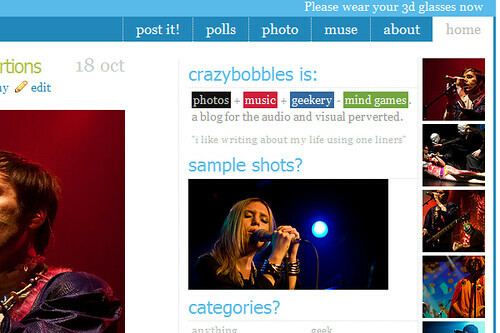 One of the site’s features is a tag and song “tagcloud” used to show which tags are popular and which aren’t. The idea is simply, for tags that are popular, you emphasise them more, this can be done in terms of font weight, size, colour and whatever styling method that enables the text to be highlighted from another text. Right now I’m only using the font size as a way of demonstrating the tag cloud but perhaps if theres time I could go about doing it for font colour too (which might need a bit of configuring to ensure it works). I’ve managed to stumble upon this article which helped me out on how I should establish the correct distribution of font sizes etc so I’ll be using it for making the tag cloud. Ever thought of how the collection of tags with varying fontsizes (known as Tag Cloud) populated. As I say ‘theres an algorithm for everything’, theres an algorithm for this too. Assuming you know all about tag popularity (if not refer previous post) I’ll go ahead explaining it. The distinct feature of tag clouds are the different groups of font sizes. Now the number of such groups desired depends entirely upon the developer. Usually having six such size-groups proves optimal. Tonight I managed to create the tag cloud. Not only that, I turned it into a function so that it can be used for more then just the admin pages. The coding was pretty much based on the above calculations to come up with the right sizes, I used percentages to portray the font sizes as it seems more relative to the web page.